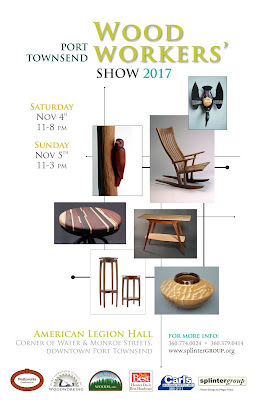 Port Townsend Woodworker's Show - This weekend! Port Townsend has a vibrant and very diverse community of woodworkers. The annual Woodworker's Show is a great opportunity to see and meet the wonderful array of furniture makers, woodturners, carvers and other makers who live in the area. The Splinter Group is seeking entries for the annual Woodworkers Show to be held November 3-4, 2018, at the American Legion Hall in Port Townsend. Submissions are sought from furniture makers, cabinetmakers, instrument makers, turners, carvers and other woodworkers in Port Townsend and adjacent areas. Your work must be well-crafted original designs. No work from kits or commercially available plans will be accepted. 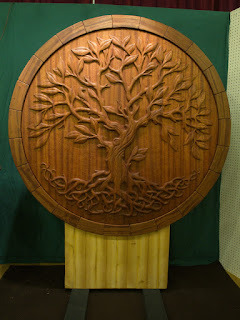 The purpose of the show is to increase awareness of the variety of skilled woodworkers in our area. You may leave business cards but we strongly recommend that you be present to sell your own work. We will not be selling your work for you. No commission will be taken on work sold. Show hours are Saturday November 3, 2018, from 11 am to 8 pm (to coincide with the Port Townsend Gallery Walk) and Sunday November 4 from 11 am to 3 pm. Thanks to everyone who came to the show! See you next year on November 3-4, 2018.